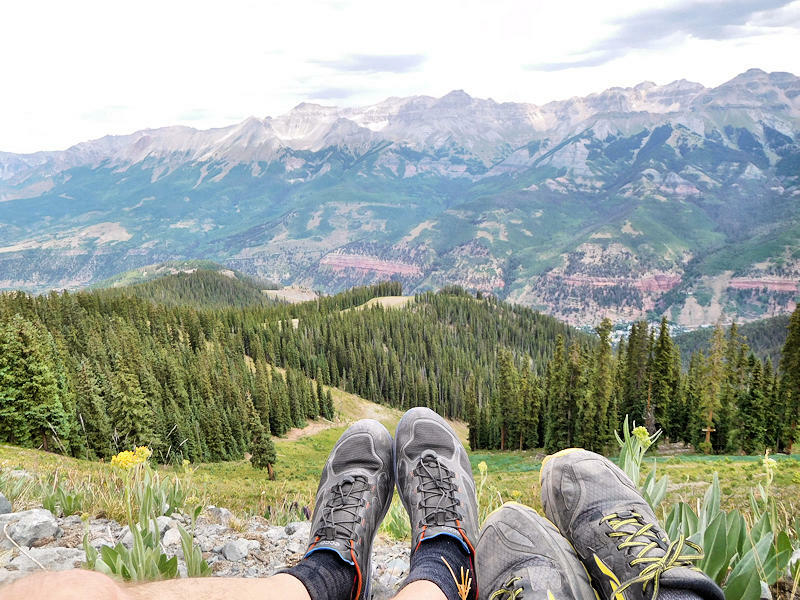 While Telluride is a top winter sports destination, we visited in summer 2018 to take advantage of fantastic hiking high in the Rockies. 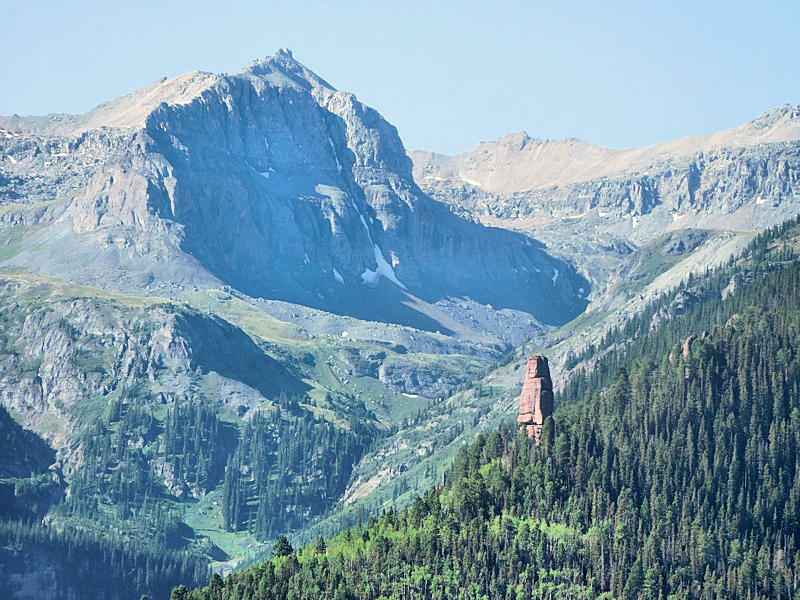 The former mining town sits in a box canyon at 8,750 feet elevation, surrounded by peaks up to 13,150 feet. Loved the cooler weather – complete with lows in the 40s each morning during our July trip. It’s easy to reach by flying into Montrose, Colorado, 65 miles away. Here a pristine, restored downtown with real estate that goes for 10X that in NC, it’s definitely a playland for the wealthy with many luxury second homes (including Oprah’s complex). But you can easily visit on a budget since the big outdoors is free to enjoy! We rented a condo on AirBnB within walking distance to downtown and most of the trails. 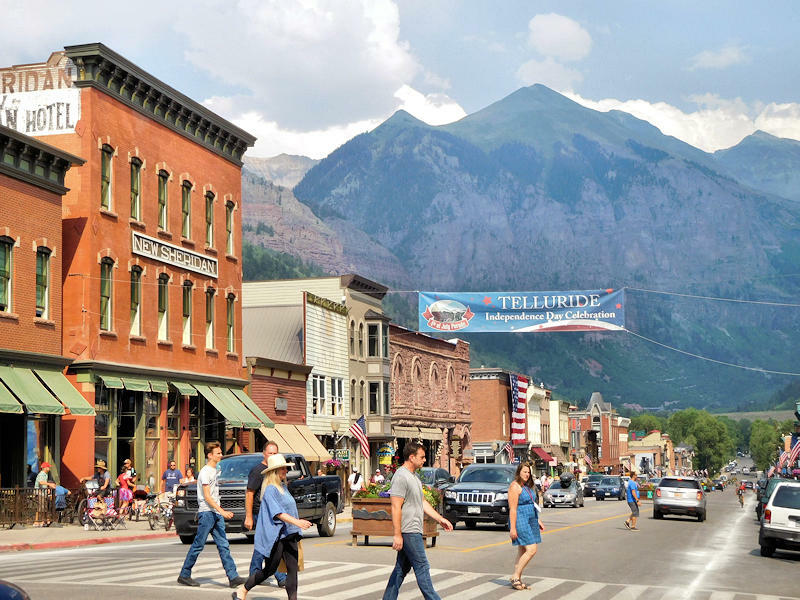 Telluride is only 12 blocks long and six blocks wide. So we started each day by walking to a breakfast spot, and then hiking from one of the many trailheads on the edges of town. After a super scenic hike of 4-5 hours, we strolled back into town for lunch! Then we explored the town and relaxed each afternoon. The above photo is from Bear Creek Falls Trail. 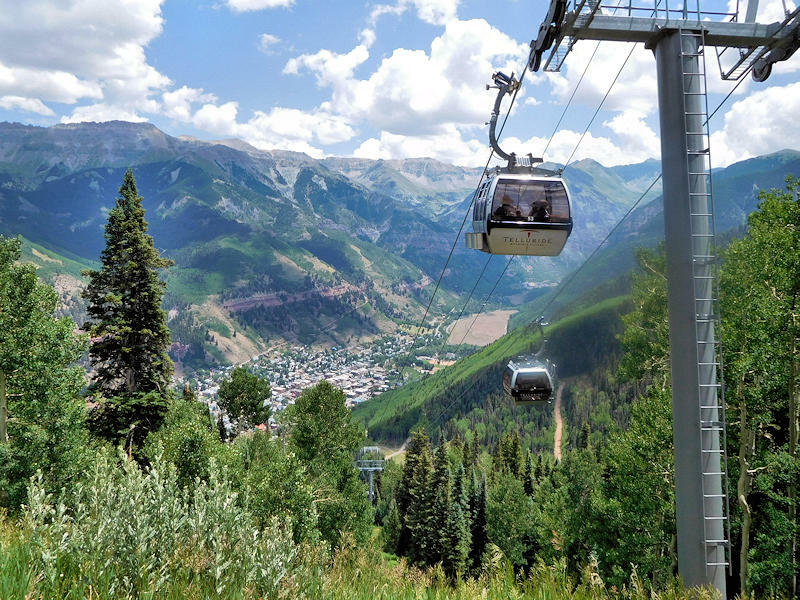 From downtown Telluride, ride the free Gondola up to Mountain Village (the primary ski village with less charm). It takes 13 minutes to make the 8-mile scenic trip. The first stop is the San Sophia Station at 10,540 feet. You can exit here for many hiking and biking options. The second stop is Mountain Village at about 9,500 feet elevation. Since there are several restaurants here, we liked riding up for lunch or dinner too. 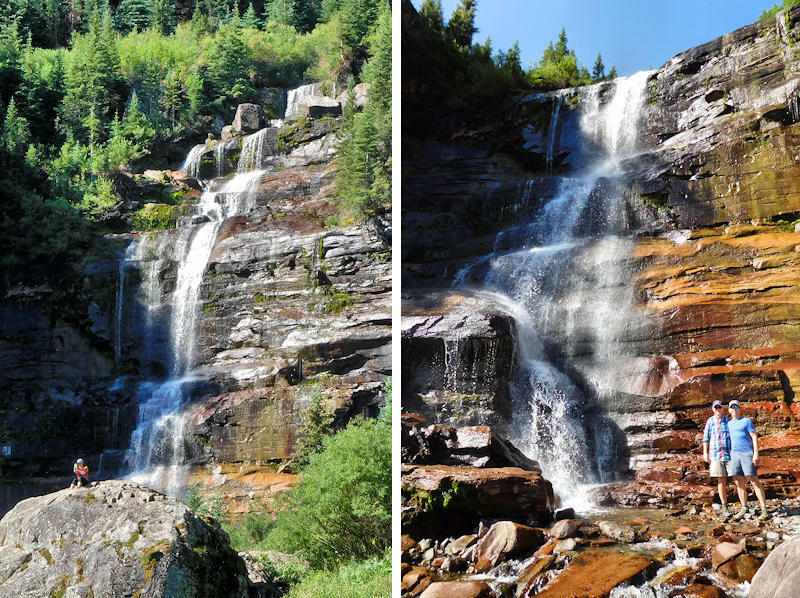 One of the most popular hikes out of town is to Bear Creek Falls. It’s about 5 miles roundtrip, climbing gradually about 1,000 feet in elevation to the waterfall. 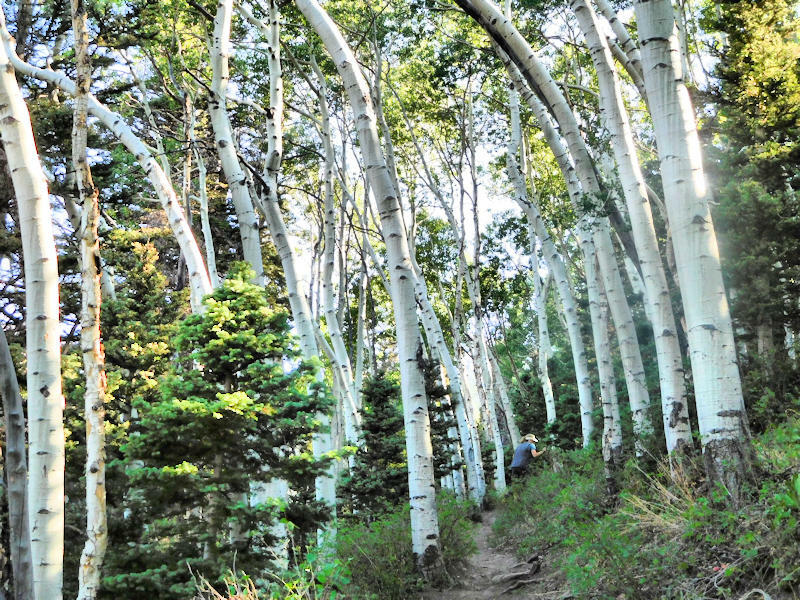 It’s a gorgeous hike with a big variety of scenery including lush forests and those mountain views. The See Forever Trail lives up to its name. Take the gondola up to the San Sophia station to begin the hike. It has some really steep sections up ski runs. That forces you to stop more to enjoy of great views along the way. 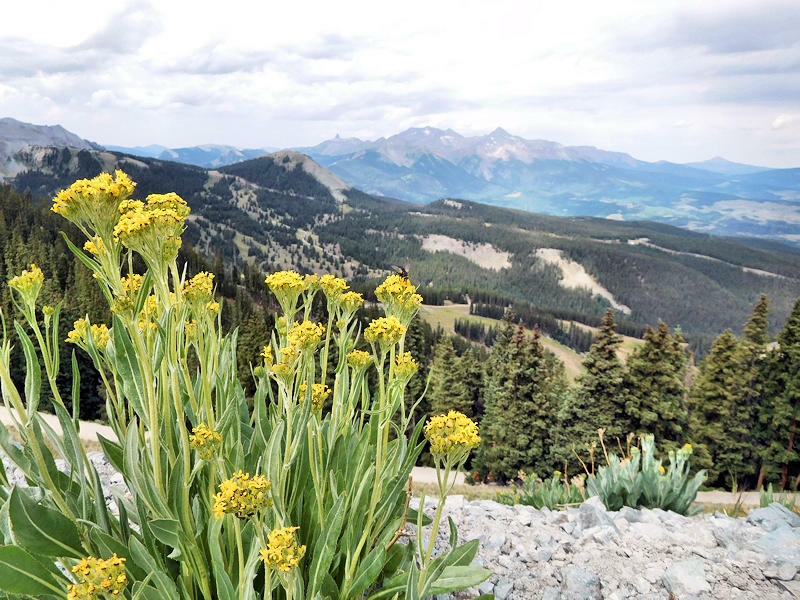 While we stopped at about two miles at the top of Lift 9 at 11,885 feet elevation, the trail continues to connect with other trails. Of course, check the weather forecast. Another advantage of morning hikes is avoiding potentially severe summer storms each afternoon during their monsoon season. The Jud Wiebe Trail is another top trail that leaves directly from town. 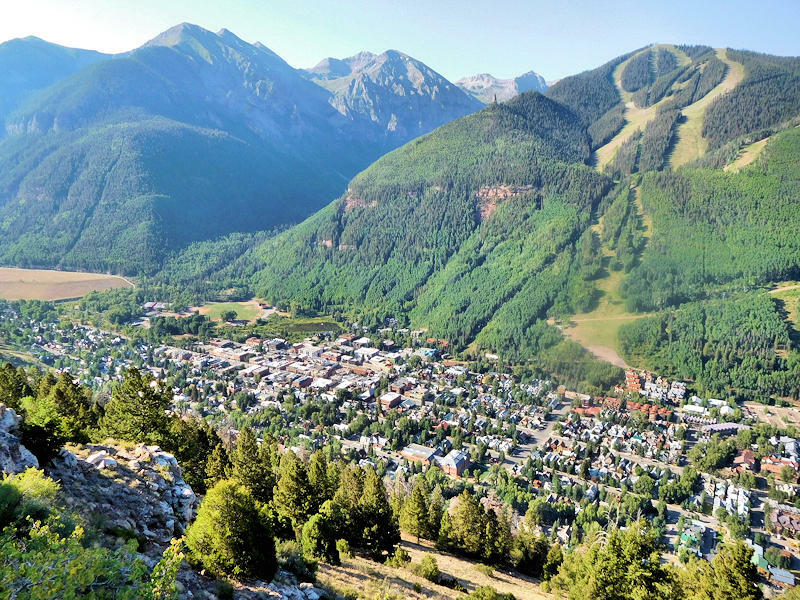 This 3-mile loop climbs about 1,300 feet with postcard panoramic views of Telluride. Looking at Needle Rock from the Jud Wiebe Trail. 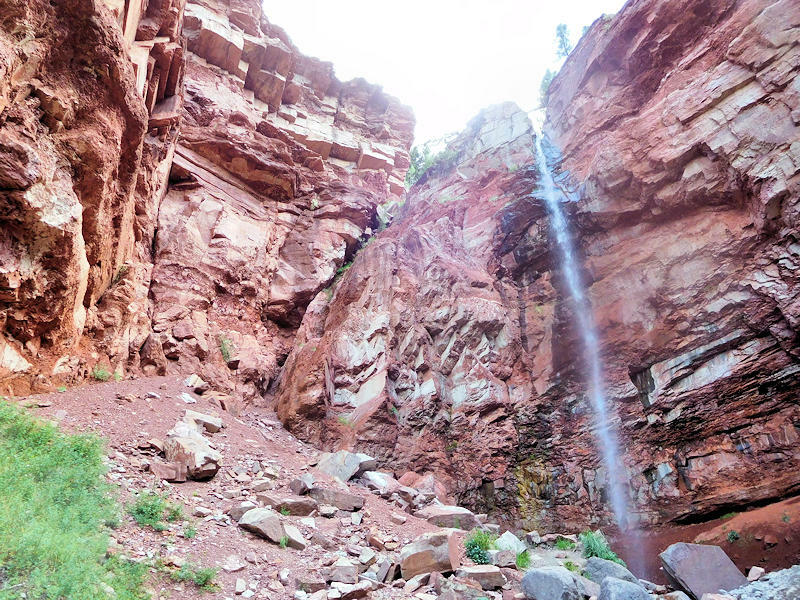 After finishing the Jud Wiebe loop, take the short (half mile roundtrip) hike to see Cornet Falls. Since Telluride was in a drought, all the waterfalls had low flows. 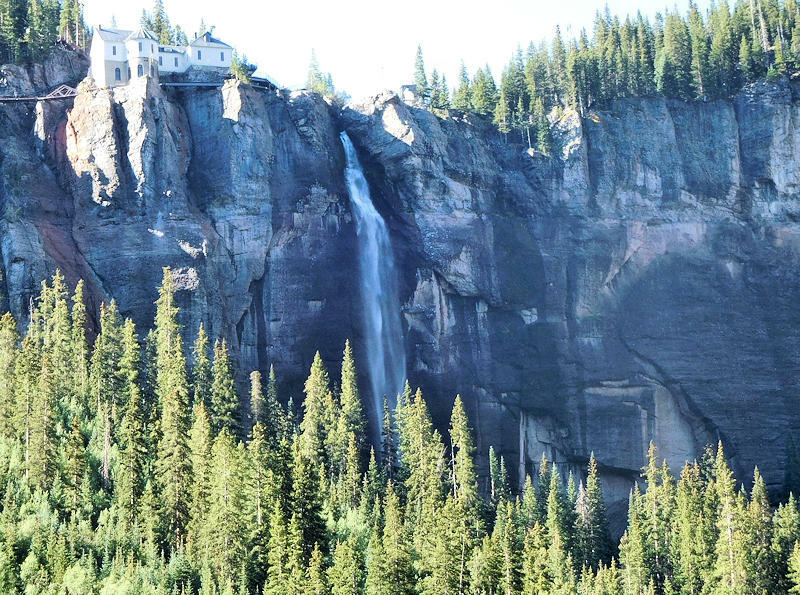 Bridal Veil Falls is the highest free-falling waterfall in Colorado at 365 feet. 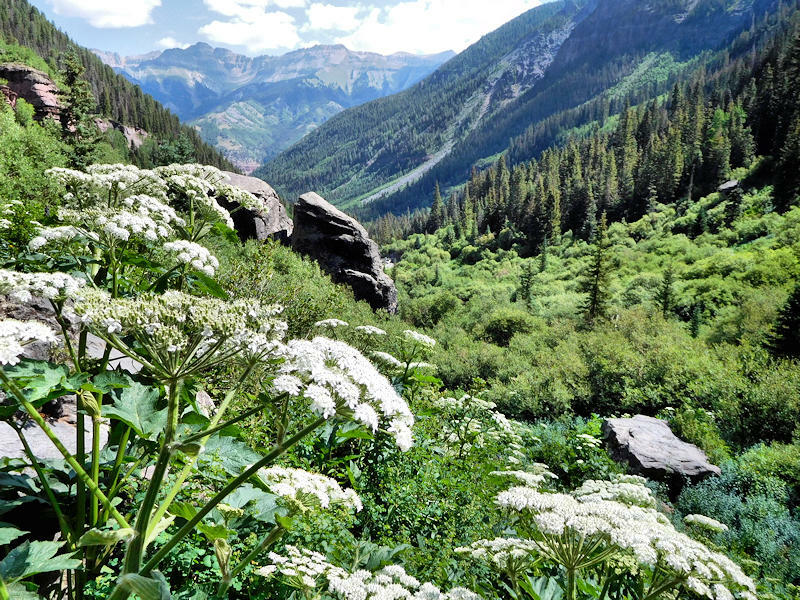 To reach the trailhead, drive to the end of the valley (about 3 miles from downtown Telluride). We parked at the lot and walked up the switchback road for 1.8 miles (1,650 feet elevation gain) to reach historic power plant on the cliff. If you rented a high clearance 4-wheel drive, you can drive up the very bumpy road to the top. That will give you a big head start to reach the most scenic part of the trail past the waterfall. Bridal Veil Trail continues past the waterfall along the rushing river into the lush valley – taking you to Blue Lake and beyond. 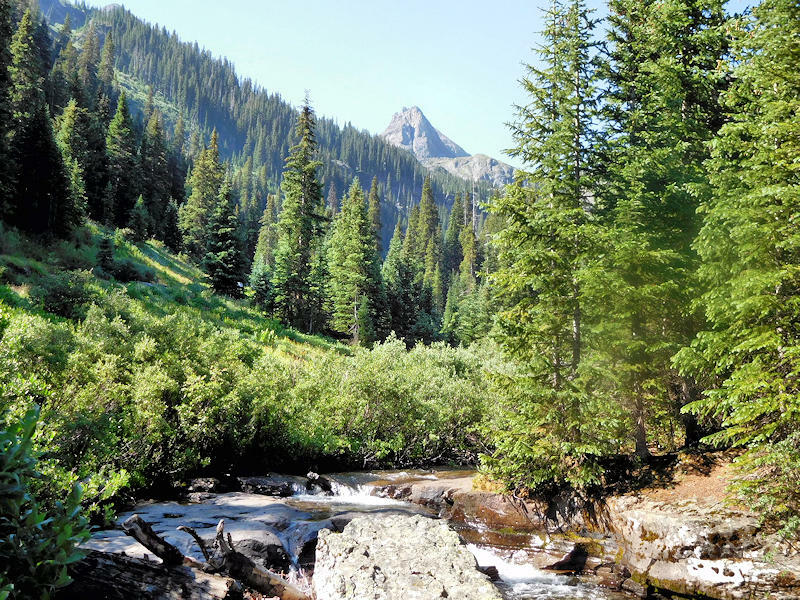 You could create a 14-mile loop and return via Bear Creek Falls. We didn’t do that! 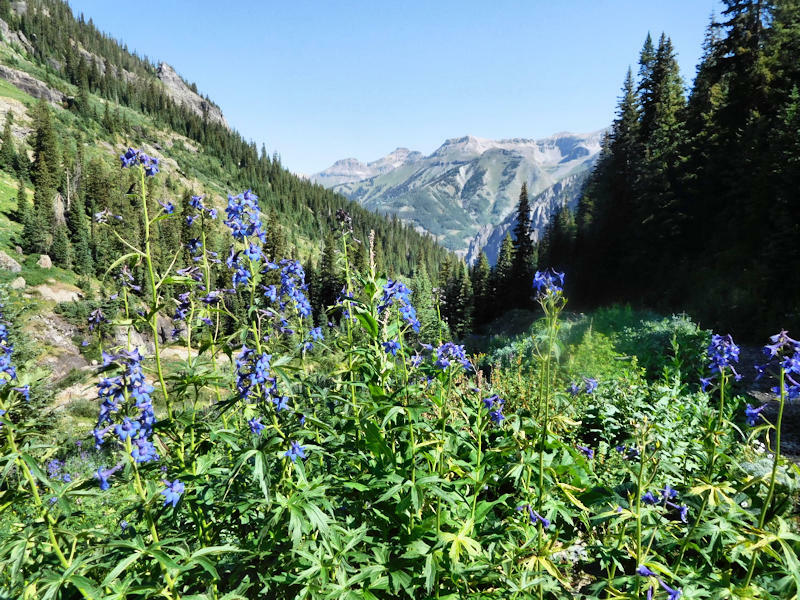 Alpine meadows above Bridal Veil Falls are loaded with wildflowers – especially in June. 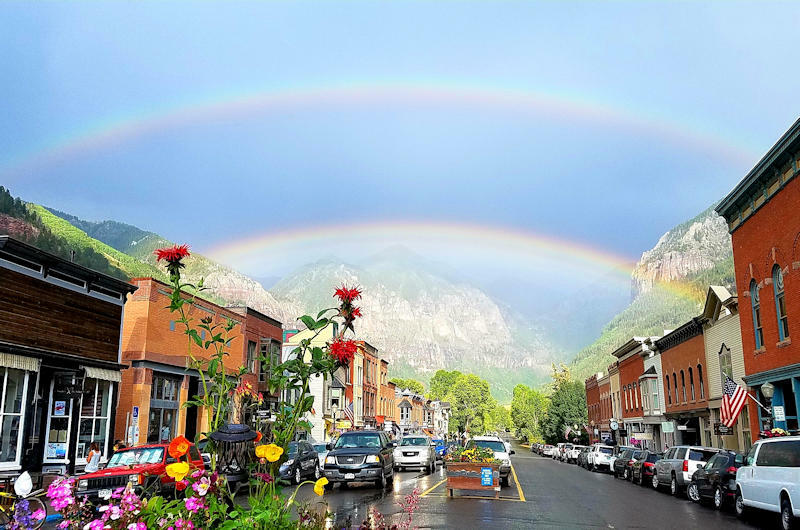 After a drought in Telluride, we were welcomed the first evening with a rain shower and double rainbow!